Imagine being transported back in time. The dimly lit streets of the West Village are awash in the sound of brass instruments. A saxophone cuts through the blow of a car horn and the upbeat tempo matches the pace of passersby. A descending stairwell opens up a dimension of strong cocktails, live music, and cool cats. Welcome to the world of jazz. If you are tired of the repetitive bass of Meatpacking’s clubs, hop down to the West Village for America’s most revered art form. Nestled among historic brownstones and triangular streets are some of the most famous jazz clubs in the world. Perhaps you’re curious about jazz or just want a taste of something different. Syncopated beats and improvised solos with dynamic rhythms can be found in these three West Village clubs. Smalls Jazz Club is an authentic experience. 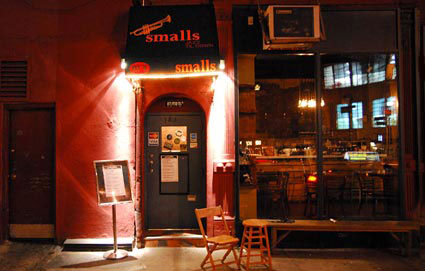 Unlike other jazz clubs, Smalls has a more laid back approach. Students only pay a $10 cover charge to hear some of the biggest names in jazz that the city has to offer. Smalls also has after-hour shows going from 1-4 AM. This club is a great way to test the waters without having to pay a large cover. The Village Vanguard is a jazz mecca with a cozy feel. Forest green walls are laden with portraits and instruments that illuminate this basement jazz club with its own eclectic history. Tickets cost $37.50 and should be purchased in advance. It is recommended to get to the venue at least thirty minutes early, as they seat you on a first come first serve basis. For a real taste of old New York, slip into a seat at Arthur's Tavern. Since 1937 Arthur’s has hosted legends like Charlie Parker and Roy Hargrove, and it still draws America’s jazz elite. Note: While there is no cover charge, the cash-only bar does have a drink minimum.